As many of you know, I’ve been collaborating with Sean Bagshaw for many years on luminosity masks and Photoshop extension panels. He not only feeds me ideas for improved ways to use pixel-based masks, but his videos have also been instrumental in explaining these techniques to the photo community. 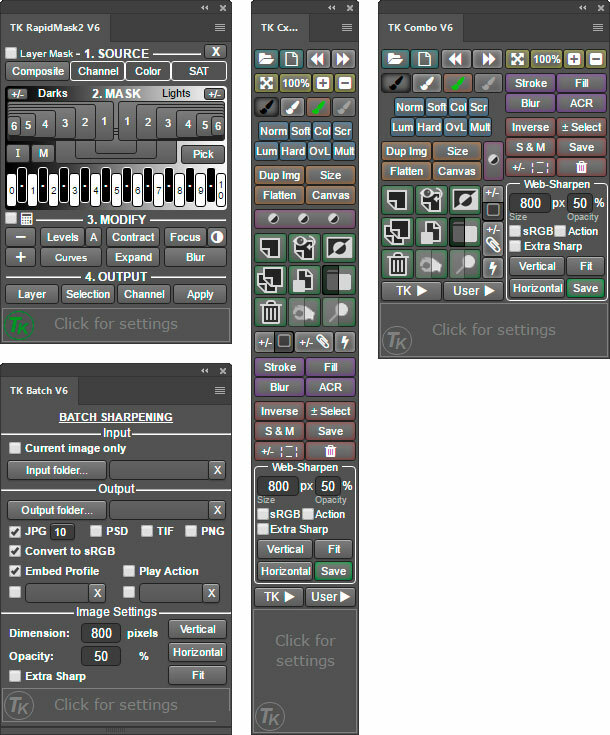 Now that TKActions V6 is complete, Sean is planning to restart his Quick Tip series on how to use the new panel. This will provide a great opportunity to watch an expert using the V6 panel, to get a more in depth look at its many functions, and to pick up some creative ideas for developing images in Photoshop. I’ll be featuring Sean’s videos on this blog and providing some commentary on the techniques, but you might also want to subscribe to Sean’s YouTube channel. That way you can get notified of the other videos that he regularly publishes. He’s got a really nice teaching style that provides a lot of information and is also easy to follow. His first V6 panel Quick Tip is below and looks at his favorite new features. It’s less than 5 minutes long and gives you an idea of what’s coming. 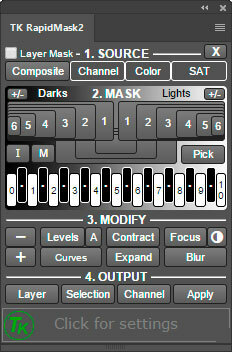 I’m pleased to announce that there is a new RapidMask2 module for TKActions. Since releasing the TKActions V5 panel last December I’ve played with several new ideas for using the Rapid Mask engine to generate luminosity and other masks in Photoshop. The new RapidMask2 module is the result of these experiments and effectively replaces the V5 Intro, RapidMask, and LayerMask modules. It has all their functionality plus lots of new features. Because it’s such a significant improvement, RapidMask2 is going to start TKActions V6. TKActions already went modular with the V5 panel, so I’ll simply be updating and releasing new V6 modules, like RapdidMask2, when they are finished. Since this first V6 module is happening relatively soon after the release of the V5 panel, the new V6 modules will be free to customers who have already purchased V5. During the transition from V5 to V6, customers will receive all V5 and V6 modules and can choose the ones they want use. Customers who purchased V5 for PS CC were emailed links to download RapidMask2 directly from the server on September 5/6. Be sure to check your email’s junk/spam folder if you missed it. Also, be sure to add the server’s address (client@e-junkie.com) as a safe email contact to insure future updates go to your inbox and do not get sorted to the spam/junk folder where they can be missed. Spanish customers have not received their updates yet. I apologize for the delay. Hopefully everything will be ready next week. There is no Photoshop CS6 version of RapidMask2. This module uses advanced coding that is only supported by Photoshop CC. V5 customers using CS6 should contact me if they upgrade to CC. Below is a list of the most important new features in RapidMask2. Better organized−Four distinct sections (SOURCE, MASK, MODIFY, and OUTPUT) that mirror the mask-making process. Source menus−New menu design for choosing different pixel data as the starting point for making masks. Spectrum interface−Compact spectrum interface for choosing different masks. New masks−Lights-6, Darks-6, and Vibrance. User-created color masks−Color masks that target specific colors can be generated with ease and converted to Rapid Masks for modification and output. Add and subtract masks with calculator simplicity−Two buttons, plus(+) and minus(-), make it so all masks can be added and subtracted just like using a calculator. 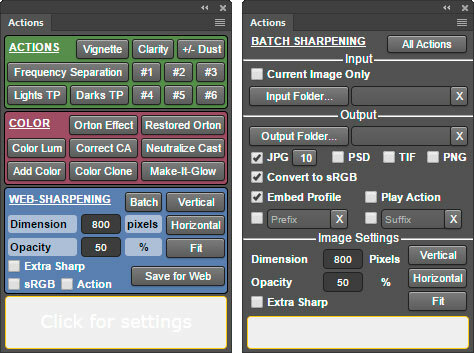 Enhanced “Layer” output button−Provides new pixel layer choices for generating layers with the current Rapid Mask as the layer mask. Updated Layer Mask mode−Provides an image-based option to quickly choose or create the best mask by having it applied directly as a layer mask on the active layer. Accent color−There is just one color for the entire module, an accent color, that users can change to whatever they prefer. Click tracking−Buttons retain an accent-colored shadow after clicking so users can track which mask they last chose. The video below reviews these features in more detail. It is best viewed in full-screen mode in order to see everything that’s happening. Sean Bagshaw has also updated his V5 Video Guide series to include five new videos that cover the RapidMask2 module in detail. A download link for these has also been emailed to customers who purchased his original V5 Video Guide. The new vids are included in his updated V5/V6 Video Guide series. The intro is shown below. 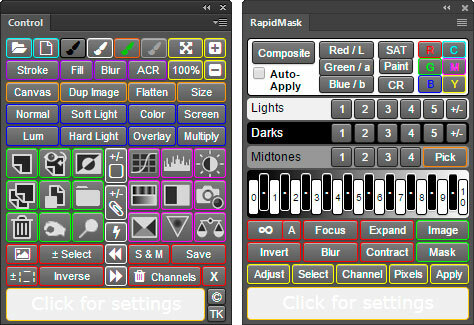 If you already have the V5 panel, I think you’ll find the new RapidMask2 module a big step forward both in masking functionality and ease of use. Please be sure to check for the free update in your email, install it, and give it a try. 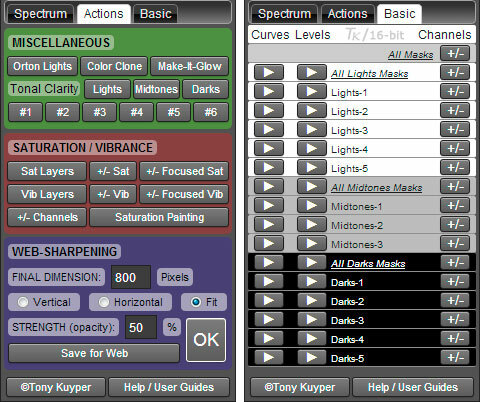 If you don’t have the TKActions panel yet, a 25% discount code is available for the next two weeks: V625off. It provides a 25% discount on anything on the Panels & Videos page. I’m pleased to announce the availability of a new extension panel for Photoshop. The TKActions Basic panel creates luminosity masks and is meant to provide a simple way for anyone to add these techniques to their workflow. The Basic panel incorporates the latest 16-bit method for making luminosity masks. 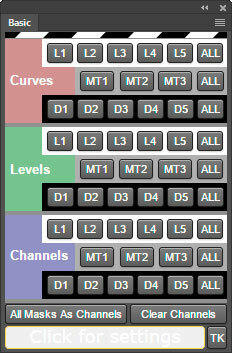 It’s essentially the “Basic” tab of the TKActions V4 panel with a new layout and added features. The panel’s embedded scripts create Lights, Darks, and Midtones luminosity masks and also generate Curves and Levels adjustment layers with luminosity masks as the layer masks. This makes it super easy to start using luminosity masks to confine adjustments to specific tones and to see how adjustments through these masks blend perfectly into the rest of the image. 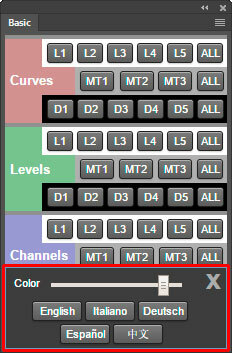 The “Channels” section of the panel creates luminosity masks on Photoshop’s Channels panel AND also creates an active selection of the designated mask at the same time. Active luminosity selections are the basis for luminosity painting, one of the most powerful methods for using luminosity masks. It’s an excellent technique for localizing brightness adjustments when burning and dodging. Painting through luminosity selections also provides precision for mask painting when exposure blending. There is an integrated active selection indicator at the top of the panel. It’s a black and white scrolling bar that turns on anytime Photoshop detects an active selection. Since some luminosity selections do not generate selection borders (marching ants), this animated indicator informs the user when a selection is indeed present. Even if the marching ants are hidden in order to better evaluate painting through a selection, the indicator stays on and continues to provide a reminder that the selection is still active. The white box at the bottom of the Basic panel provides rollover Help for any button. Simply roll the mouse over a button and this area displays a message as to what the button does. Clicking on the rollover Help window opens the panel’s settings. 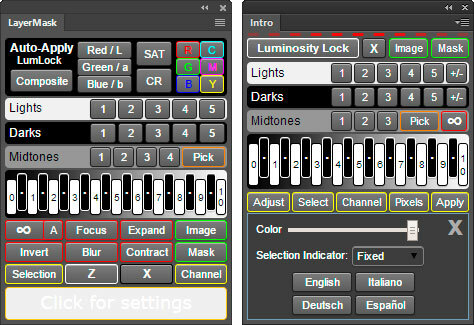 From the settings dialog, users can control the panel’s color saturation and choose from five different languages for the panel’s interface. The Instructions PDF is a short document that provides a more complete overview of the panel and what it does. The TKActions Basic panel is free and can be downloaded here. It works on Mac and Windows computers and there are versions for Photoshop CC and Photoshop CS6 in the download folder. Four videos by Sean Bagshaw are also included to insure users are able to get the most benefit from the new panel.